The very latest technologies to improve the appearance of your smile. Our aim here at Dentures at Clayfield is to provide you with superior denture solutions that we hope will transform your smile and give you the confidence to flash it whenever and wherever you feel like it. We do this by creating dentures that are a good aesthetic fit for you as well as being both comfortable and functional and taking the necessary time to fully understand your concerns and expectations for your treatment. Unlike a lot of other practices, we use our very own onsite laboratory to create your unique dentures using only the very best resources. Having our own laboratory allows us to remain firmly in control of the quality of your dentures and to ensure superior craftsmanship during production. We specialise in all aspects of denture treatment including adjustments, cleaning, customisation, denture repairs, precision dentures, relines and replacements to offer a comprehensive range of denture solutions. Dentures are custom-fitted false teeth that we use to replicate both the form and function your teeth that are missing or badly damaged. 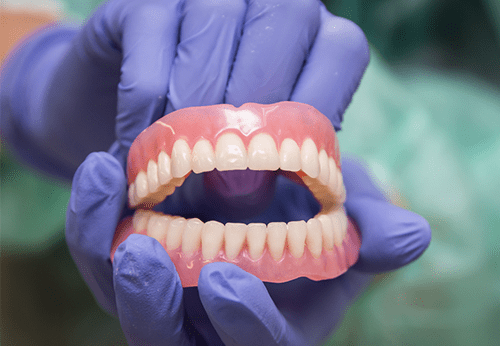 A full or complete denture is how we replace all your natural teeth and a partial denture uses your remaining teeth for structural support in order to replace your missing teeth with an acrylic or metal framework. So whether you are missing one tooth, multiple teeth or a full arch, we provide a comprehensive range of dentures to suit your unique needs. When you receive your dentures from us, they may take some time to get used to and we don’t want you to worry should you not feel totally at ease with them in the early stages of wearing them. This is because your mouth needs time to adjust to them and while we do take the greatest of care in creating dentures that fit like a glove, there may be some slight adjustment needed in the first week or two as your dentures settle in. There a number of changes that may occur when you are first fitted with dentures and we will prepare you as best we can by providing ongoing support and advice. One of the fantastic things about dentures in the modern age of dentistry is that they look very natural and won’t draw attention as something that looks out of place or false. They may feel like they take upon more space in your mouth and your lips can sometimes appear fuller, but after a few days the muscles in your face will relax and they will start to look and feel more natural. It is possible that some patients may also experience a few speech difficulties but this only temporary and should subside after a few days. Because your dentures feel different to your natural teeth, your tongue needs some time to adapt to the new conditions and to learn to move within it in order to deliver the speech you intend. But this problem can be easily overcome and should you wish to speed that process along you can speak or read out loud in front of a mirror. There are also some eating considerations that will streamline the process of getting used to your new dentures and in addition to cutting your food into smaller pieces, we also recommended that you eat smaller bites and chew small portions evenly on both sides of your mouth. Avoid eating anything that requires to bite down with your front teeth during the formative stages of your treatment, you can start to do this when you have mastered your dentures. To find out more about our range of dentures, or to make an appointment with us, please click here.